Where Can My Tank Be Located | Suhre's Gas Co. Inc.
Our service department will work with you to install your tank in a safe location on your property that allows for clear delivery access. If you are building a home and want to discuss tank location, please give us a call and we’ll be happy to mark a location for you. The National Fire Protection Agency (NFPA) Code 58 provides regulatory requirements as to the distance and location of propane tanks. The diagram below illustrates the tank size and distance requirements. 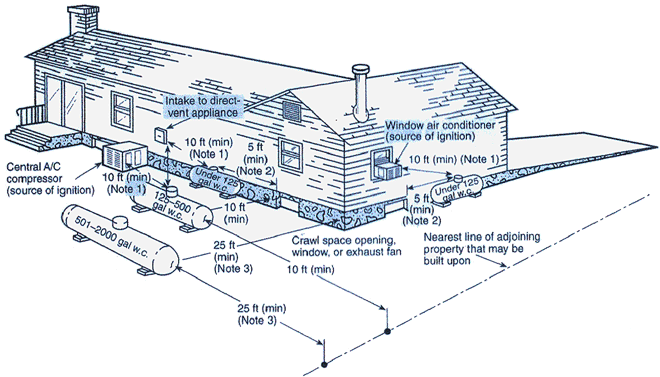 Note 1: 5-ft minimum from relief valve in any direction away from any exterior source of ignition, openings into direct-vent appliances, or mechanical ventilation air intakes. 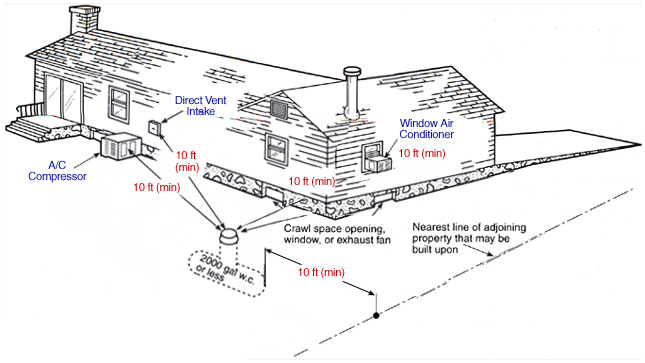 Note 2: If the cylinder is filled on site from bulk truck, the filling connection and vent valve must be at least 10 feet from any exterior source of ignition, openings into direct-vent appliances, or mechanical ventilation air intakes. Note 1: Regardless of its size, any ASME container filled on site must be located so that the filling connection and fixed maximum liquid level gauge are at least 10 feet from any external source of ignition (e.g., open flame, window A/C, compressor), intake to direct-vent gas appliances, or intake to a mechanical ventilation system. Note 2: Refer to 3.2.2.2(c). Note 3: This distance may be reduced to no less than 10 feet for a single container of 1200 gal (4.5 m3) water capacity or less, provided such container is at least 25 feet from any other LP-Gas container or more than 125 gal (0.5 m3) water capacity. Refer to 3.2.2.2(e).